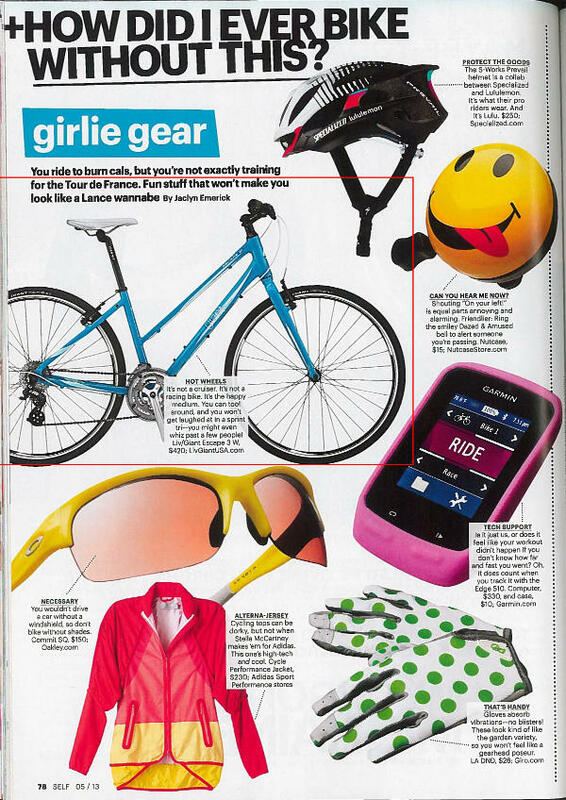 The May 2013 issue of SELF magazine lists some of the favorite "Girlie Gear," including "How Did I Ever Bike Without This?" 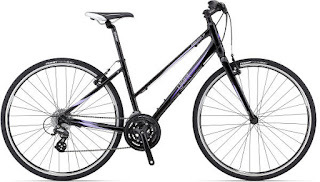 Their choice of bicycle is the Giant Escape 3 for Women. Their take is that "It's not a cruiser. It's not a racing bike. It's the happy medium. You can tool around, and you won't get laughed in a sprint tri--you might even whiz past a few people!" 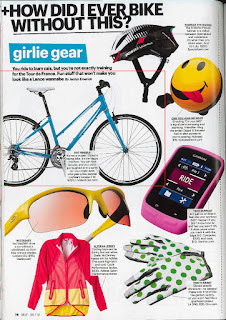 We agree; it's the perfect all-around bike, whether you're testing the racing waters in a sprint triathlon, zipping around the neighborhood for errands, riding to work or school, riding one of our Night Rides on the Towpath Trail or Cycling Makes Sense Fitness Rides, or an event like the Bike MS Pedal to the Point. And at $419.99, it's easy on the wallet, too. Now in stock at all three Century Cycles stores; call us to confirm size and color availability at the store nearest you. Eric Hyde (left) and Jared Gibson (right) left Colorado Springs, CO on May 30, 2013, and are pedaling to raise funds and awareness for Amyotrophic Lateral Sclerosis (ALS, or Lou Gehrig's Disease). Eric's father passed away from the illness last year. They stayed with friends in Medina last night, and stopped by the Peninsula store today on their way to Burton, Ohio. They expect to reach their final destination of Edinboro, PA this Saturday. 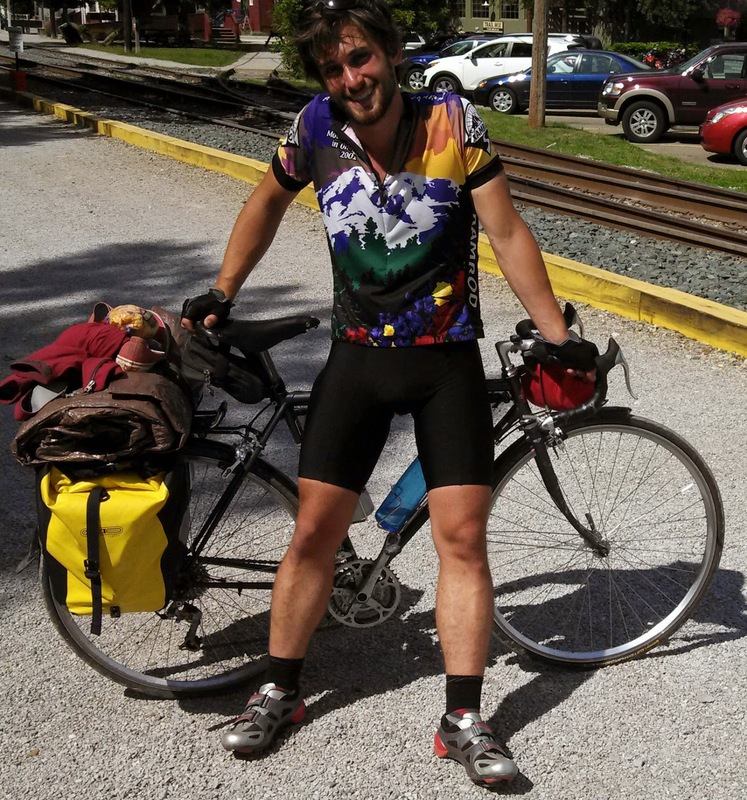 You can see photos of other long-distance cyclists that have visited all three of our stores in our Bicycle Touring Photo Gallery. At the Century Cycles store in Peninsula, when we tell customers that we're going to get them a bike from the basement, often their first thought is, "You have a basement?" 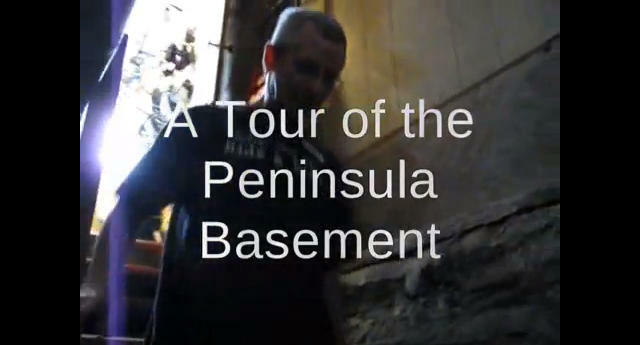 Yes, indeed, in tiny humble little Peninsula, there is a basement. It's not a very friendly place, though, and you wouldn't want to follow us down there. Produced, written, and directed by Kevin. Cinematography by Jackie. 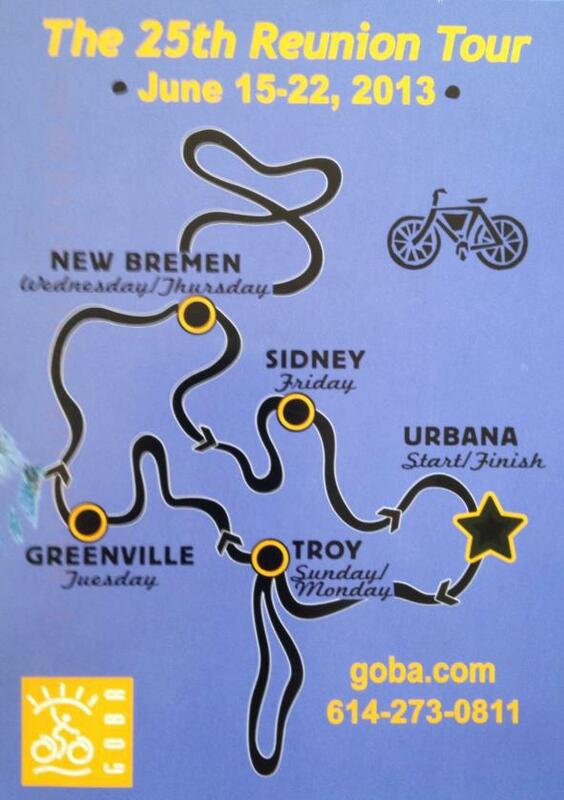 Congratulations to all the riders who completed the 25th annual Great Ohio Bicycle Adventure (www.goba.com) last week! How was it for you?? 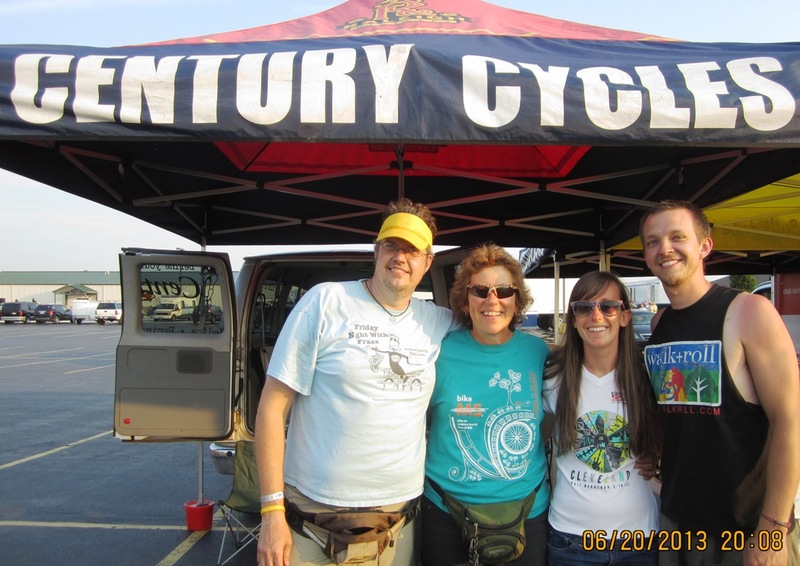 Century Cycles had a great time, with Rich Oettinger from our Peninsula store, Josh Ronschke from our Rocky River store, and Chris Walters from our Medina store traveling with the bicyclists all week, providing mechanical support and cycling necessities at each day's stop. "Hello, my name is Carol Kerslake and my daughter, Kelsey, and I just completed the 25th Anniversary GOBA tour. 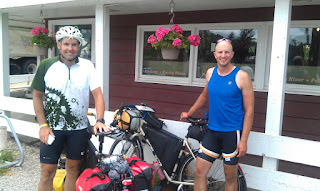 Attached is a picture of us with Josh and Rich who were along on the ride. 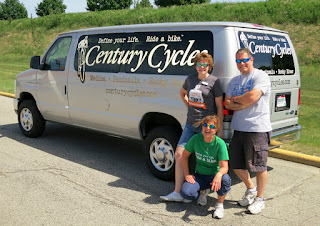 I just wanted to say how much I appreciate Century Cycles supporting us on the ride and how hard both Josh and Rich worked and what great guys they are!" The Friendsville Freebie Fifty / Fall Foliage & Frostbite Frolic is an informal ride organized by the Medina County Bicycle Club, traditionally held on the last Saturday in October. You don't have to wait 'til fall, though, to enjoy this 50-mile ride through the scenic back roads of Medina county. The ride starts at Public Square in downtown Medina, and soon heads to rural roads with some rolling hills. As the name of the ride suggests, you'll ride through Friendsville, a.k.a. Seville, where you'll find restaurants and shop for a mid-ride fuel-up. If that's not enough, you'll also have opportunities for stops in Wadsworth, before you return to the square in Medina. You can check out the full details of the Friendsville Freebie Fifty / Fall Foliage & Frostbite Frolic Ride on Century Cycles' Garmin Connect profile and download the route to your own Garmin device. Non-Garmin users can see the route on MapMyRide.com. 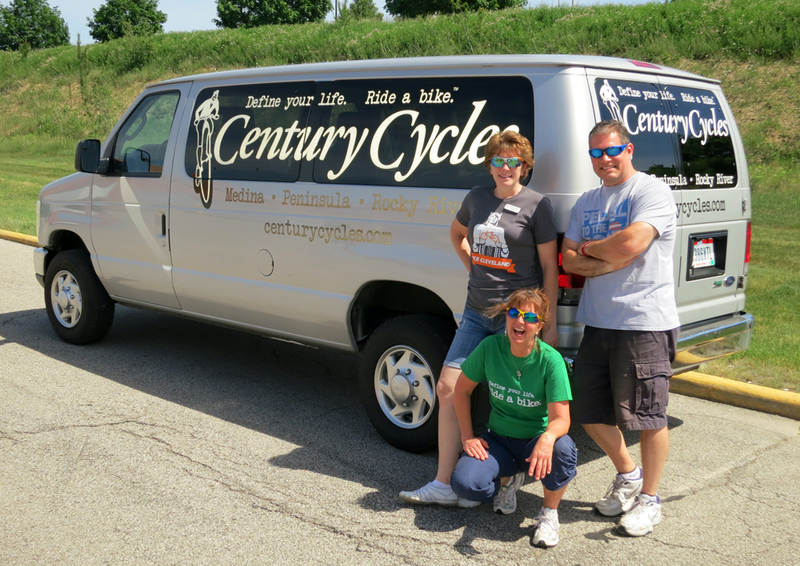 Cathy, Bob and Lynne from Century Cycles-Medina show off the all-new graphics on our company van, thanks to Fred The Sign Guy at Auto Trim Design in Medina! Our June poll is online and ready for your voting! Just go to www.centurycycles.com/for/poll to vote on your favorite recovery drink. Don't see your favorite listed, or have an "other" you want to share? Tell us in the comments! In commemoration of National Bike Month and Bike To Work Week, our May poll asked about your bicycling-to-work habits. The good bike commuting news? 57% either have biked or are currently biking to work on a regular basis! That said, it's not an option for 43% of respondents, and only 1% are planning to try it. You can find more photos of long-distance touring cyclists that have visited all three Century Cycles stores at our Bicycle Touring Photo Gallery. Wearing a helmet is the most important thing any cyclist can do to prevent serious injuries. Whether or not you consider yourself a “serious” rider, you should have a helmet on no matter where or how far you ride. Buying and wearing your helmet does not have to be a painful process. The staff at Century Cycles has years of experience in fitting helmets for adults and children of all abilities, sizes, and budgets. 1. Try on several different models and brands to find the best fit. Some of the lower-priced models have “one-size-fits-most” approach, while the higher-priced models come in Small, Medium, and Large for a more custom fit, and some offer women’s-specific models. We even have an Extra-Large model (the Giro Venti) for those with larger-than-average heads. Although safety is the first concern, it's okay to think about style, too! Our helmets come in a wide variety of colors to match your bike or favorite cycling jersey. In addition, helmets from Nutcase are available in a myriad of fun designs, including the popular Watermelon Head! 2. Wear the helmet level so that it covers your forehead. This is the most common mistake we see among helmet wearers, both children and adults. Wearing the helmet tilted back on your head leaves your forehead exposed to impact, and increases the chances of the helmet falling off, or not properly absorbing an impact even if it stays on. You should have a gap the size of about two fingers between the front edge of the helmet and your eyebrows. 3. Adjust the rear fit dial, side buckles, and chin strap for optimal safety and comfort. A helmet that’s the correct size for you can still feel uncomfortable (and be unsafe) if it’s not properly adjusted. First, put the helmet on in the correct position (see tip #2 above). Reach behind your head and turn the fit dial to tighten or loosen the internal harness so that it’s snug around your head. Next, adjust the buckles on the side straps. The buckles should sit just below and slightly forward of your ear lobes. Adjust the slack on the chin strap so that you can get two of your fingers between your chin and the strap. This leaves just enough room to hold the helmet on securely, while still allowing you to breathe and talk normally. 4. Don’t store your helmet in direct sunlight. Also try to minimize the amount of time you have to leave your helmet in the car. Extreme heat will degrade the material inside the helmet, compromising its protective ability. 5. Replace your helmet after a crash or after five years of use. Bicycle helmets are designed for a single impact. If you suffer a crash, do not wear that helmet again because it will NOT effectively protect your head if you have another crash. Many bicyclists are asking if STOMP (the Summit Tour of the Metro Parks) is happening this year, and the short answer is no. But the good folks at the Metro Parks Serving Summit County (www.summitmetroparks.org) have organized a new event this year that they hope will appeal to more bicyclists all summer long -- the Summer Biking Spree! Cyclists of all ages can enjoy the inaugural Summer Biking Spree on July 1 through August 31. 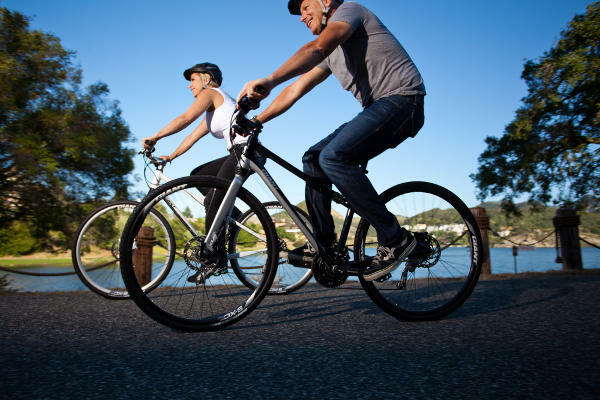 Earn rewards by riding at least five sections of the multipurpose trails managed by Metro Parks, Serving Summit County: The 34-mile Bike & Hike Trail, 22.4 miles of the Towpath Trail and the new 4.2-mile Freedom Trail. Riders can earn a reflective sticker and bicycle license plate, or the sticker and a vehicle-window cling. *Out-of-county residents pay $5 to receive their rewards. One lucky participant – drawn at random from submitted forms (due by 10/15) – will win a new Raleigh bicycle from Century Cycles in a drawing to be held on October 16. The number of completed forms will determine the odds of winning. You can get a spree headstart at a free kickoff event on Sunday, June 30, from 12 to 3 p.m.! Ride the Towpath Trail into Lock 3, 200 S. Main St., Akron (or park in the adjacent deck) for live music, vendor displays and mascot appearances. Buy lunch and a spree T-shirt (while supplies last) for just $10! Spree forms are now available at Century Cycles in Peninsula. Additional forms are available at the visitors center at F.A. Seiberling Nature Realm, the park district's administrative offices, and all Acme Fresh Market stores. Kyle Brooks lives in Akron with his wife and two daughters, and works as a teacher in Medina. He has a collection of bikes, mostly vintage or classic styled steel road bikes, and even keeps a couple of bikes on display in his classroom. His favorite bike shop is the Century Cycles store in Peninsula, though the new Medina store is super nice. Kyle previously wrote articles for our blog, his thoughts and products reviews of the Pearl Izumi Elite Barrier Convertible Jacket, Pearl Izumi Select Thermal Long Sleeve Jersey, Pearl Izumi Amfib Tights, and NiteRider headlights and taillights. 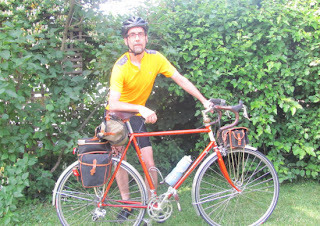 In his latest guest blog, he shares his experiences after one full year of commuting to work by bike. Having just wrapped up a year of commuting to work by bike, I have some observations to share. I work as a teacher in Medina County, but I live in Akron, with a commute of roughly 14 miles each way. I first tried commuting by bike in May, 2012. I had wanted to ride to work for a long time, but I just felt like there were too many “obstacles” preventing me from doing it. I was concerned that I didn’t have a safe route to work. I was concerned about the fact that I need to dress pretty professionally for work. I was concerned about needing to shower, etc., after riding that distance. As it turned out, the biggest obstacle was mental. Once I determined that I was going to try it, the other obstacles either didn’t materialize, or were handled pretty easily. The route to work was the first thing that needed to be planned. The shortest, most direct route between Akron and Medina is State Route 18, which is also the main thoroughfare between the two cities. Other less-traveled routes would add more distance, more hills, and more time. Another thing I considered was the fact that the back roads, while less traveled, are also less well-lit, and have many blind spots where cyclists can “disappear” between hills and around bends. These can be concerns at any time, but can be even more hazardous in the dark early morning hours. In the end, I decided to take the most direct route in the morning. At the early hour when I leave, I find Rt.18 actually has very little traffic. I also felt that, should I have a mechanical problem or even just a flat tire, I’d have no problem finding a good, well-lit place to fix it. The interchange at Interstate 77 is a bit dodgy, with a fair amount of traffic exiting the freeway, but it’s manageable, and only a small part of my commute. In the afternoon for the ride home, the traffic on Rt. 18 is much heavier, so I take one of the back road routes. The extra distance isn’t a problem since I’m not quite as pressed for time. As far as clothing goes, I wear bike-specific clothing for the ride, and change when I get to work. Rather than pack professional work wear with me each morning and take it home each night, I keep a couple of suits, a pair of dress shoes, and some ties at work, and I take in a few days worth of clean shirts, socks, etc. on the days that I do drive. By keeping a couple days’ worth of clothes at work, I have one less thing to worry about as I prepare to ride in the morning, and I’m spared the embarrassment of showing up to work one day having forgotten to pack something important (Oh my God, I forgot to bring pants!!!). Good technical bike wear is a must for a commute of the distance that I ride, and over the course of the year, I’ve added a lot to my cycling-specific wardrobe. Although I worried about needing a shower after my ride, that turned out not to be a concern. Of course, teaching at a public high school, we do have locker rooms and showers available – a luxury not everyone has at work. In practice, though, it hasn’t really been necessary. I do keep a towel or two and the necessary shower supplies at work, but I’ve found that it’s usually so cool in the mornings, even in June, that I don’t really need a shower when I arrive. Now, I couldn’t say it would be the same situation on a hot, humid morning in July, but normally whatever cleaning up I need to do when I get to work can be done in a regular bathroom sink with a washcloth. Once I’ve changed into clean clothes, nobody has any idea that I’ve ridden my bike to work, and no, I don’t think people are just being polite. After my successful bike commuting experiment last May, I started riding regularly when the new school year started last August – weather permitting. I didn’t relish the idea of riding in the rain, so I drove when it was either raining or the chance of rain was more than likely. People asked me how long I thought I could keep it up. Honestly, I didn’t know. I figured I’d be good until maybe October, or as long as the morning temperatures were above 40 degrees. But really, I had no idea what my limits might be. Every time I thought I might be nearing my limit, the next thing I’d know, I’d gone beyond that limit and had to set a new one. October came and went, and I was still riding. Forty degrees came and went, and I was still riding. Before I knew it, it was November, then December, with morning temps in the 30s. I bought some thicker tights, better gloves, and a warmer jacket, and temps in the 20s became possible. In the spring, I even invested in some decent rain wear, and then even a threat of showers didn’t really put me off so much. By the end of the school year in June, I had managed to keep a year-long biketo-work average of 50%, which had been my goal. It had actually been higher in January, but then February and March were horrible months to ride, with singledigit night-time temperatures and lots of sleet or freezing rain. Looking only at the last two months of the school year, though, my average was nearly 75%. Gallons of fuel saved: 76 (based on my car’s measured overall average 33mpg). Fuel dollars saved: estimated $296 (based on a year-long average fuel cost of about $3.90/gal for diesel – yes, my car runs on diesel). In addition to all that, I also lost 15 lbs., though that was more or less accidental. I wasn’t trying to lose weight. Of course, now I need to get my suits altered. That money I saved on fuel has to go somewhere, right? In the end, I think biking to work this past year was a good experience. I know there are probably a lot of other cyclists out there who have thought about biking to work but maybe have talked themselves out of it for the same reasons that held me back for so long. I really hope that this helps those people see that it’s worth giving it a try. The Ronald McDonald House of Cleveland and Century Cycles are happy to announce that the rained-out Night Ride on June 1st has been rescheduled for Saturday, June 29! The newly-rescheduled Night Ride has all the same details – same times, location, snacks and goodies – which you can find at www.centurycycles.com/for/RMH, along with pre-registration (which has been RE-OPENED for anyone who wants to join the ride on its new date). If you pre-registered for June 1st, you do not need to pre-register for June 29th. We regret if you pre-registered for June 1st and are unable to join us June 29th, but we hope this new date works for the majority of riders. If Mother Nature should once-again frown upon us on June 29, there is no other rain date planned, due to many other calendar commitments for both organizations. As always, please email info@centurycycles.com if you have any questions or concerns, and thanks so much for your patience. See you June 29th! Electra Bicycles Spring Fling - Take $50 Off any 3-speed bicycle from Electra! 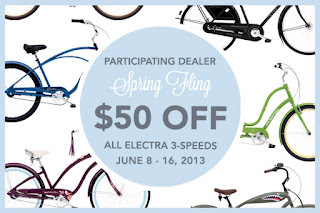 Celebrate Spring with Electra Bicycles at Century Cycles! 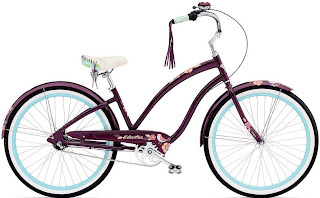 Now through June 16, 2013, take $50 OFF the regular price of any in-stock 3-speed bicycle from Electra! Model selection varies by store; please call us to verify! 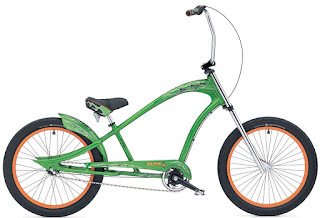 We'll gladly send any bike to the store most convenient for you (Medina, Peninsula, or Rocky River) for a test-ride; no extra cost or obligation on your part! Deagan's Bike Night is back starting June 13! Deagan's Kitchen & Bar and Century Cycles are teaming up once again to host Deagan’s Bike Night every Thursday from June 13 through October 10, 2013. 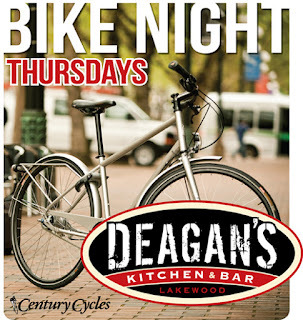 Simply ride a bicycle on Thursdays to Deagan's Kitchen & Bar (www.deagans.com), located in the heart of Lakewood at 14810 Detroit Avenue, anytime from 5pm to close to receive 15% off every item on their award-winning gastropub menu, plus get an entry form to win a brand-new Raleigh commuter bicycle from Century Cycles bicycle store. The more Thursdays you bike, the more you save, and the more chances you get to win the bike and other grand prizes at the Deagan's Bike Night finale party on October 10! To kick off the first Deagan's Bike Night on June 13, Deagan’s will tap Fat Head’s Brewery’s Trailhead Pale Ale, a special beer brewed to aid the Cleveland Metroparks’ mountain bike trails. “We personally love to ride our bikes anywhere and everywhere possible, and we’re thrilled to have our own bike night here at Deagan’s,” said Daniel Deagan and Erika Wolfe, owners of Deagan’s Kitchen & Bar. The Deagan’s Bike Night grand prize, the Raleigh Misceo 2.0, is an ideal commuter bicycle for urban wandering to Deagan’s and all over town, yet still tough enough to tackle the Royalview mountain bike trail in the Cleveland Metroparks. It retails for $549.99. For more information about Deagan’s Bike Night, go to www.centurycycles.com/for/DeagansBikeNight. 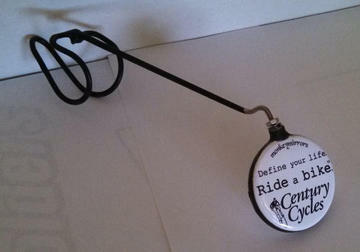 Century Cycles is proud to offer again this year Cycling Makes Sense Fitness Rides. Organized in conjunction with the Medina County Park District, these FREE beginner-friendly rides are a great way to get out on your bicycle for a non-aggressive ride and experience the park's wonderful multipurpose trails. Lynne from the Century Cycles store in Medina will start each 6-10 mile ride with some basic tips for how to keep you and your bike fit. There is a minimum of 5 participants and a maximum of 15 participants per ride. 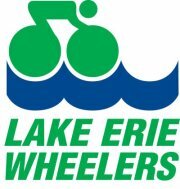 Everyone is invited to a road ride with Lake Erie Wheelers (www.lakeeriewheelers.org) that will be rolling out of Century Cycles-Rocky River on Tuesday, June 11, at 6:30pm SHARP. And non-LEW members can learn about one of Northeast Ohio's best riding clubs and consider joining! The ride is about 27 miles and will head south down the Valley Parkway through the Metroparks. The B group will ride at an 18-20mph pace, and the C group will ride at 14-18mph. A post-ride gathering will be at Burntwood Tavern, just down the street from the store. If you plan to go to the Burntwood, email your RSVP to LEW President Kim Dreher at rottigirl2@yahoo.com so she can book a section big enough for everyone. 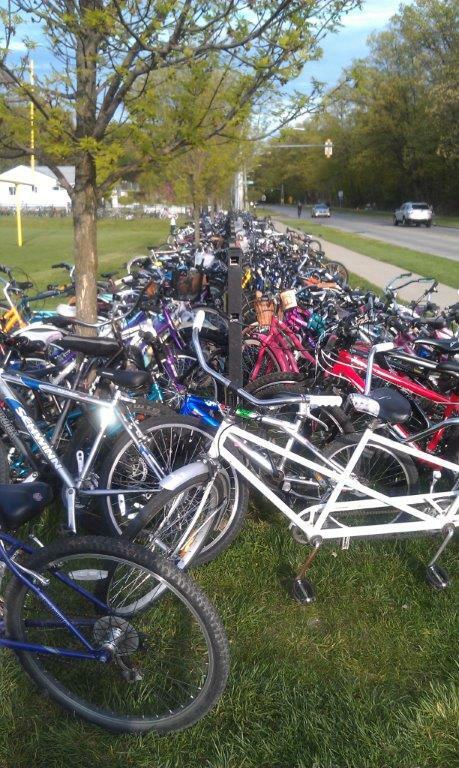 634 bicycles parked at Bay Middle School on May 8, 2013. The biggest bike-to-school program in the nation grew even bigger this year. Century Cycles’ Bike to School Challenge (www.centurycycles.com/for/BTS) concluded on May 24 with celebrations in Bay Village, Medina and Rocky River of the students’ record-setting bicycling accomplishments. · Saved their parents $10,125.68 on gasoline, based on the current Ohio average gas price of $3.76/gallon and an average vehicle fuel economy of 21.4 MPG. · Participation overall was up 11% over 2012, making Bike to School Challenge’s sixth year its best year ever. 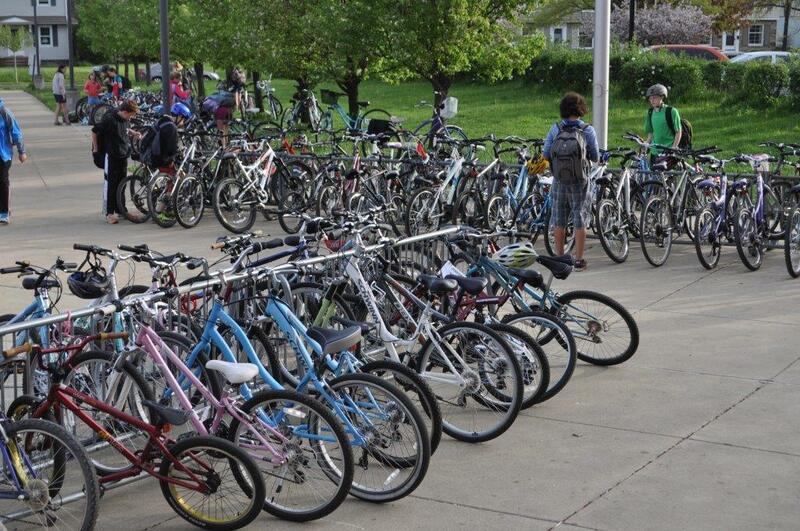 · Bike to School Challenge students have biked 221,797 miles to school since the program began in 2008. 538 students biked each day of the challenge on average, a whopping 66% of Bay Middle’s enrollment of 820 students and up 13% over last year’s average of 474. 27% of Bay Middle School Students (226 of them) biked all 15 school days of the challenge – rain or shine (or sub-freezing temperatures). 634 students biked on May 8 (77% of the school), the highest ride day in the history of the challenge and coincidentally National Bike to School Day. Toward that end, Raleigh Bicycles and Century Cycles awarded 16 Raleigh bicycles to students as prizes, and Raleigh gave cash awards of $3,000 to the schools and $4,000 to the cities for bicycling improvements. "I have never seen a bike-to-school program that generates the level of participation and excitement that this one does. It is a credit to the tremendous amount of commitment and work by the schools, its local bike shop Century Cycles and the entire community to engage and inspire the students. Raleigh Bicycles is extraordinarily proud to be part of Bike to School Challenge,” said Speyer. Founded in 2008, Century Cycles’ Bike to School Challenge communicates to students the impact that bicycling instead of driving can have on their health and the environment, and they are incentivized with daily and grand prizes to bicycle as much as possible to school for three weeks. Students carry cards that are stamped for each bike-ride to school and can be entered into the grand prize drawing that concludes the challenge. Bicycling was a daily habit for over 10% of the participants; organizers report that 447 students biked every single day of the challenge. "As biking in Greater Cleveland continues to grow, it is exciting to see 447 students bike to school all 15 days of the Bike to School Challenge,” said Jacob VanSickle, executive director of Bike Cleveland (www.bikecleveland.org), a local bicycling advocacy organization and challenge sponsor. “Bike Cleveland is proud to recognize the commitment of these students by giving them student memberships to Bike Cleveland and adding them to our powerful movement of advocating for a more bicycle friendly region." His pride was echoed by city leaders. Their efforts are also attracting national and international attention. On the same day other national media were flocking to Cleveland for a high-profile kidnapping case, Bicycling magazine (www.bicycling.com) sent executive editor David Howard to Northeast Ohio to check out Bike to School Challenge. He wrote an online feature story titled, “The Land Where Kids Ride: In suburban Cleveland, an astonishing number of children ride to school. Here’s what we can learn from them” (http://bit.ly/ZUztVW). The Atlantic Cities transportation blog dubbed Bay Village “a bike-to-school mecca” in an online story (http://bit.ly/12m9qFD), which was read by the principal of a school in Australia that contacted challenge organizers for ideas how to replicate the program there. Rocky River Middle School on May 6, 2013. 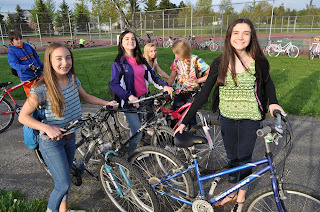 In just three weeks of bicycling to school from May 6 through May 23, Rocky River Middle School students biked 14,618 miles, averaged 326 students biking per day, an impressive 52.5% of the school arrived by bike each day (up 67% from 2010’s 30% average and up 18% over last year’s 44% average), and set a new high-ride day on May 9, when 377 RRMS students biked to school (61% of the enrollment) – all new Rocky River Bike to School records. From May 6 through May 24, Bay middle and high school students biked 28,257 miles and took 9,783 round-trip bicycle rides to school. Since Bay Bike to School Challenge began in 2008, Bay students have biked 157,733 miles and saved an estimated 173,506 pounds of CO2 emissions. It was a record-setting year at Bay Middle School – an average of 538 students biked each day of the challenge, a whopping 66% of the school’s enrollment of 820 students and up 13% over last year’s average of 474 and 634 students biked on May 8 (77% of the school), the highest ride day in the history of the challenge. At Bay High School, an average of 114 students per day biked, or 14% of the school. Students arrive at Root Middle School. Medina middle school students logged 14,752 miles on their bikes during the three-week program on May 6-24, up 12% over last year’s inaugural challenge and a record-setting year for both schools. Claggett Middle School averaged 79 bicyclists per day during the challenge (8% of the school’s enrollment), up 22% over last year’s challenge. They also set a new high-ride day on May 8 and again on May 17, when 94 students biked to school. Root Middle School averaged 136 bicyclists per day (16% of the school), up 6% over last year and a new record for the school. For more information about Bike to School Challenge, go to www.centurycycles.com/to/BTS or follow the program at www.facebook.com/BikeToSchoolChallenge or on Twitter (@BTSChallenge). Define your life. And see what's going on behind you! NEW, and now IN STOCK in all three Century Cycles stores! Our bicycle helmet mirrors are designed in the tradition of the beloved Chuck Harris. Each is hand-made in the USA by Monkey Mirrors, and custom-printed with our logo and our popular "Define your life. Ride a bike." slogan. The wire is flexible, attaches to any helmet, and is easily bent to your preferred view. You can also adjust the mirror from side to side, and hand-tighten the nut to lock the mirror in place. 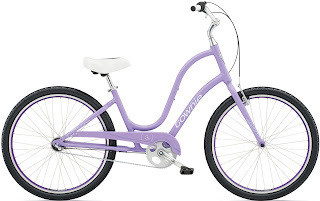 You can purchase them online, or stop by our stores in Medina, Peninsula, or Rocky River to take one for a test-ride! Labels: bicycle mirror, Define your life.